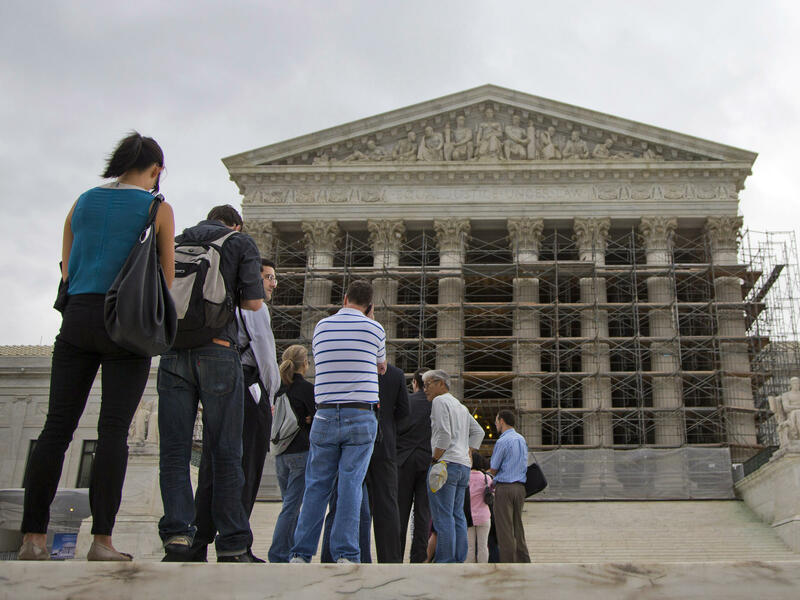 People wait in line for the beginning of the Supreme Court's new term on Oct. 7. The U.S. Supreme Court takes up the issue of affirmative action again Tuesday, but this time the question is not whether race may be considered as a factor in college admissions. Instead, this case tests whether voters can ban affirmative action programs through a referendum. In 2003, the high court upheld the University of Michigan Law School's affirmative action policy. The next day, opponents of affirmative action launched a referendum campaign to bar such programs, and in 2006, voters overwhelmingly approved a ballot initiative amending the state constitution to ban affirmative action programs in higher education. Michigan's state colleges and universities promptly abandoned any use of race or ethnicity to promote diversity, and minority enrollment plummeted. In 2012, a federal appeals court ruled that the referendum itself was discriminatory, and the U.S. Supreme Court stepped in to decide the issue. 'Equal Treatment' Or 'Separate And Unequal'? Michigan Attorney General Bill Schuette contends that is exactly what the state's voters did. "What the Michigan citizens did and said in a vote, by 58 percent of the people, is that it's wrong to treat people different on the basis of your race or color of your skin," he says. "That's what this case is about — equal treatment." But opponents of the referendum claim that the ballot initiative rigged the system. They note that other state admissions policies are set by the popularly elected boards of regents of the three state universities. Indeed, affirmative action defenders observe that some regent elections have focused on the issue of affirmative action. If that process isn't working, they argue, the state Legislature could give the power to set all admissions policies to another body. Or the Legislature could enact a different system to promote diversity — for instance, guaranteeing admission to students graduating in the top 10 percent of their high school classes. "The one thing they can't do," says the American Civil Liberties Union's Mark Rosenbaum, "is to take our political process, to take the way that decisions are made with respect to higher education, and say, 'There will be one set of rules for race, which are particularly onerous, and another set of rules for all other admissions policies, including all other preferences.' 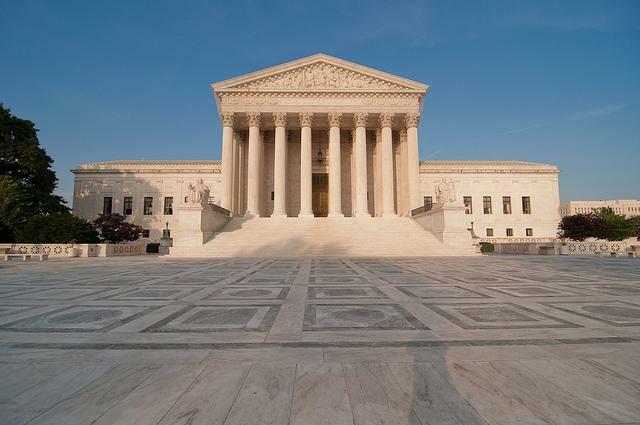 "
Rosenbaum will tell the justices on Tuesday that passage of the referendum means that the only way for minority groups to reinstate affirmative action programs is to re-amend the state constitution. That task is extremely difficult — and, he asserts, doubly difficult and costly, given that the state is 79 percent white. In contrast, if other Michigan citizens want to change other preferences in university admissions — for example, the preference for the children of alumni — they can lobby the regents. "They have created a separate and unequal system when it comes to considering racial matters," he says. At issue in Tuesday's case is not just the Michigan affirmative action referendum, but a line of Supreme Court decisions dating back to 1969. Those decisions established the "political process doctrine" and struck down state referenda that the court said targeted racial minorities. In one case, for example, the state referendum prohibited a local busing program that was used to desegregate schools. Schuette, however, calls the political process doctrine "somewhat antiquated" and asserts that, in any event, his state's referendum is different. "Those other cases," Schuette says, "removed a provision with respect to equal treatment under the law. We adopted something that requires equal treatment." The elephant in the room in this case, of course, is the whole question of affirmative action in higher education. When the Supreme Court upheld the Michigan program in 2003, the vote was 5 to 4. Justice Sandra Day O'Connor's majority opinion stressed that affirmative action programs are supposed to be temporary, and that "25 years from now, the use of racial preferences will no longer be necessary." But O'Connor has retired, replaced by Justice Samuel Alito, who has made no secret of his hostility to affirmative action. With the issue back before the court last term in Fisher v. University of Texas, it was something of a surprise when the justices punted and sent the case back to the lower court for further examination. Most observers expect there will be no such punt on the Michigan referendum. The clear odds are that the justices will sustain it. And I'm David Greene. The U.S. Supreme Court seemed skeptical about affirmative action when it sent a high-profile Texas case back to lower courts over the summer. They are returning to the issue today. 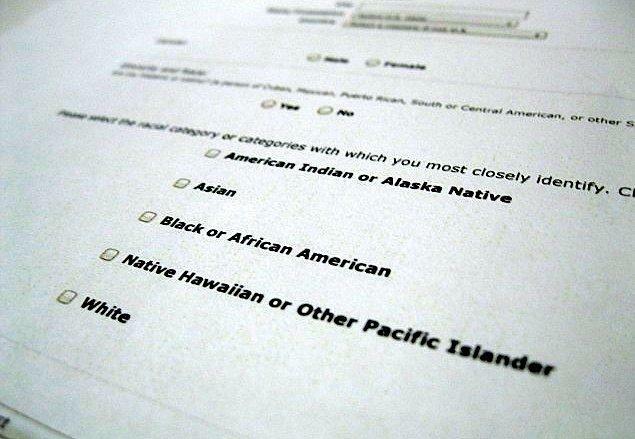 This time, the question is whether voters can ban affirmative action programs by referendum. NPR legal affairs correspondent Nina Totenberg has this preview. NINA TOTENBERG, BYLINE: In 2003, the Supreme Court upheld an affirmative action program at the University of Michigan. Three years later, however, Michigan voters approved a referendum amending the state constitution to bar any consideration of race in higher education. Michigan state schools immediately abandoned any use of race or ethnicity to promote diversity, and minority enrollment plummeted. In 2012, a federal appeals court ruled that the referendum itself was discriminatory, and the Supreme Court stepped in to decide the issue. In recent years, the high court's conservative majority has become increasingly skeptical of race-based policies. As Chief Justice John Roberts put it in one opinion: The way to stop discrimination on the basis of race is to stop discriminating on the basis of race. Michigan Attorney General Bill Schuette says that's exactly what the state's voters did. BILL SCHUETTE: What the Michigan citizens did and said in a vote, by 58 percent of the people, is that it's wrong to treat people different on the basis of your race or color of your skin. That's what this case is about - equal treatment. TOTENBERG: Those seeking to strike down Michigan's referendum claim, however, that the ballot initiative rigged the system. Their argument goes something like this: All other state admissions policies are set by the popularly elected Board of Regents. If the state wants to change that, it could take away the regents' power to set admissions criteria and give it to some other body; or it could enact a different system to promote diversity - for instance, guaranteeing admission to students graduating in the top 10 percent of their high school classes. MARC ROSENBAUM: The one thing they can't do, though, is to take our political process - to take the way that decisions are made with respect to higher education - and say there will be one set of rules for race, which are particularly onerous, and another set of rules for all other admissions policies, including all other preferences. TOTENBERG: That's the ACLU's Marc Rosenbaum. He'll tell the justices today that in the wake of the anti-affirmative action referendum, the only way for minority groups to change the law is to re-amend the state constitution with another referendum drive; a task that is doubly difficult and costly, given that the state is 79 percent white. In contrast, if other Michigan citizens want to change any other preferences in university admissions - for example, the preference for the children of alumni - they can lobby the regents. ROSENBAUM: They have created a separate and unequal system, when it comes to considering racial matters. TOTENBERG: At issue in today's case is not just the Michigan affirmative action referendum, but a line of Supreme Court decisions that date back to 1969. Those decisions established what has come to be known as the political process doctrine. Under that doctrine, the court struck down state referenda deemed to target racial minorities - for example, in one case, a referendum that effectively prohibited busing to desegregate schools. Michigan's attorney general, Schuette, asserts that his state's referendum is different. SCHUETTE: Those other cases removed a provision with respect to equal treatment under the law. We adopted something that requires equal treatment. And it's somewhat of an antiquated doctrine of law as well. TOTENBERG: The elephant in the room in today's case, of course, is the whole question of affirmative action in higher education. When the Supreme Court upheld the Michigan program in 2003, the vote was 5 to 4, and Justice Sandra Day O'Connor's opinion for the majority stressed that these programs are supposed to be temporary. She said she expected there would be no need for them in 25 years. Last term, the issue was back before the court with O'Connor retired and replaced by Samuel Alito, a justice who's made no secret of his hostility to affirmative action. So it was something of a surprise when the justices punted on the issue. Most observers expect no punting on the Michigan referendum. The odds are that the referendum will be sustained. A new hearing in the Fisher v. University of Texas affirmative action case has been scheduled for Nov. 13. Three judges from the Fifth Circuit Court of Appeals will gather in Austin to hear oral arguments in the case from both sides. UT officials said the hearing will occur after both sides submit their briefs for the case, but did not say much more about the hearing. Update (July 15, 2014): The Fifth Circuit has ruled that UT's affirmative action policies can continue. Update: The Fifth Circuit Court of Appeals is hearing arguments today in Fisher v. University of Texas at Austin, the case that questions UT's use of race in its admissions process. In June, the U.S. Supreme Court punted the case back to the Fifth Circuit Court of Appeals after deciding the Fifth Circuit didn't apply the strictest scrutiny to UT's admissions policies. While most UT students are admitted based on whether they’re in the top seven percent of their graduating class, some are admitted based on what the university calls a “holistic review.” An applicant’s race is one element of that review. Back in 2008, a white student named Abigail Fisher was denied admission to UT under the holistic review. She sued saying she was a victim of reverse discrimination. Lower courts upheld UT’s affirmative action policy. Update: UT Austin officials are reacting today’s ruling on the university’s use of race as a factor in admissions decision. For UT, the 7 to 1 ruling from the Supreme Court sending the case back to a lower court doesn’t change anything – for now. President Bill Powers painted the ruling as a win for UT Austin – and higher education in general.